Baptist Health, an award-winning, full service Montgomery AL regional medical center contracts with SurgiScheduler (SGSPro) to manage daily surgery schedules, On-Call assignments, meeting and vacation schedules for three hospital-owned surgical practices. Central Alabama Women's Care - a 5 surgeon OB/Gyn practice joins September 2017. Montgomery Surgical Specialists, a general surgery group subscribed in April 2013. Says Julia Ventress, VP Baptist Health, " The SurgiScheduler program is meeting our needs very well. I am able to take a pulse of what is going on with these groups. I think some of our other clinics would be interested in using it. " Practice Manager, Samantha Frank says, "SurgiScheduler is critical to our efficient operations at both MSTA and MSS; it is the one true schedule". Franciscan Missionaries of Our Lady Health System, Louisiana’s largest Catholic healthcare organization chooses SurgiScheduler SGSPro, the cloud-based surgical group scheduling software by WebScheduler LLC. A growing cardiothoracic practice provides service to Our Lady of Lourdes and Heart Hospitals in Lafayette LA. Angela Woodall, RN | Clinic Supervisor says, "SurgiScheduler enables our schedulers to meet the exacting demands of our surgeons. Our scheduling staff sees where every one is... who's out, who's on-call, in the OR, in a meeting, or in the clinic all on one page!" Cardiovascular & Thoracic Surgical Center, a vibrant 9 surgeon group in Baton Rouge, LA completes eight years subscribed to SGSPro. CEO Chuck Mock says, "We rely completely on SurgiScheduler. Ask any interested group to call me for a referral." Start your SGS Pro trial Calendar Now! Orlando Health, a full service regional medical center subscribes to SurgiScheduler (SGSPro) to benefit CT surgery group. The Heart Institute's Cardiothoracic surgeons, Schedulers and Practice managers track daily surgery schedules, Hospitals Lists, Rounding and On-Call assignments, meeting and vacation schedules. Practice Coordinator Rebekah Sorenson says, "The SurgiScheduler program is just about perfect. The surgeons rely on it completely, and it's an effective way to communicate schedule changes with them. I joined the practice in 2013 and learned the program quickly because it does what I do." Novant Health Presbyterian Medical Center in Charlotte, NC contracts with SurgiScheduler to provide SGSPro to the nationally ranked top 10% Heart & Vascular Institute, a hospital-owned Cardiothoracic and Vascular Surgery Group of 14 surgeons and PAC's. The Heart & Vascular Institute Group sees patients at 39 locations in the greater Charlotte area. Says, Robin Davis, primary scheduling nurse, "Novant uses EPIC and I don't know what I would do without SurgiScheduler. With SurgiScheduler I can see everything!" Carter Surgical LLC, a Mobile Surgical Laser Operator in Richmond, Virginia contracts with SurgiScheduler to schedule 23 Laser Technicians providing service to 39 Hospital OR's in 3 States. Carter's transition to web-mediated scheduling was a requirement of their largest hospital chain customer. Moving to SurgiScheduler was accomplished inside a few short weeks. The Carter Group required a newcustom programming features to track Preventive Maintenance schedules on 2 dozen devices now available to all new MMDO customers. Start your free MMDO calendar trial by clicking here. 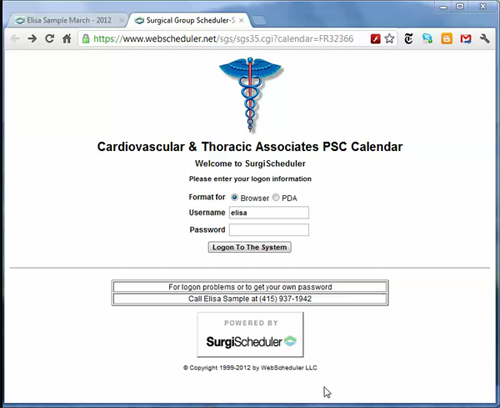 SurgiScheduler SGS Pro, a secure, proprietary cloud-based scheduling engine that tackles the surgery scheduling juggling routine of multiple locations, changing hospital rounding lists, patient room numbers, meetings, clinics, surgeries, consults, and call and vacation schedules, announces a subscription service agreement with Cardiovascular Surgeons, PA in Orlando (CVS) designed to expand scheduling capacities to top-tier performance. Raleigh NC - Carolina Vascular Surgery & Diagnostics subscribes to Surgical Group Scheduler (SGS) to manage, track & report on surgery, call and vacation schedule, and to Web-enable this busy Vascular Surgery practice. --CVSD's Steve Kagan, M.D. says, "With SurgiScheduler, we found what we needed, and more. We were looking for a program that was HIPAA compliant and web/PDA-enabled that would allow us to schedule procedures, meetings, maintain a hospital list, and a call schedule. The SurgiScheduler team allowed us to test Surgical Group Scheduler and then assisted us in customizing the program for our practice". Southwest Heart & Lung, a Phoenix/Flagstaff cardiothoracic and vascular surgical group subscribes to Surgical Group Scheduler (SGS) to manage schedules and assist in the process of merging with another, smaller, group of surgeons. Says Monica Guerrero, SWHL Administrator, "I cannot get reports like that even from our billing program. I love it! And, the feedback I am getting from our schedulers is very positive." InSound Medical, Inc., a Newark, CA medical device manufacturer contracts with WebScheduler LLC to design a version of SurgiScheduler to manage Trainers' schedules, customer training, and consumer awareness events throughout the United States. Management has a real-time look into customer's progress in the training cycle, product adoption rates and the geographical growth of the Company. Chicago area Midwest Clinical Imaging subscribes to Registry Scheduler (RS) to manage and Web-enable this growing Radiology Group's Daily Call, Rotation & Vacation schedules. MCIRAD suggested a new rotation feature be added to RS which is now available as a configurable option to new users. California Urologic Services, a Tempe, AZ-based mobile Greenlight surgical laser services provider contracts with SurgiScheduler. CUS employs Registry Scheduler (RS) to manage all elements of a busy mobile medical laser services business both in Northern & Southern California. 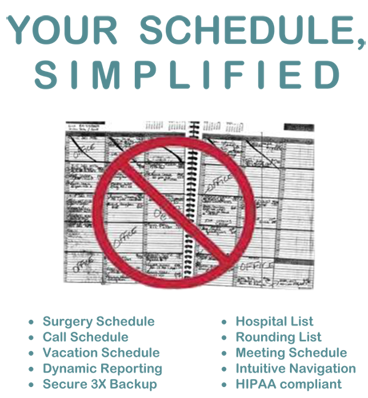 More than 100 surgery schedulers in clinics & hospitals post requests for service to the CUS SurgiScheduler Operating Calendar. Podiatry Associates of Indianapolis, PC, an 11 surgeon podiatry practice with 10 separate clinics and multiple surgical Locations subscribed to SurgiScheduler in September 2015. United Surgical Assistants, Inc., a Tampa-based, multispecialty Registry scales contract to 10 states with SurgiScheduler. USA, Inc. employs Registry Scheduler (RS) to manage surgery schedule, hospital, FA & surgeon authorizations, credentialing, call and vacation schedules for 130 Locum Tenens Physicians, FA's and PA's who assist on surgical cases each day in ten states. Staff logins exceed 3000 per week to accomplish more than 3500 surgical cases each month. Hawthorne Cardiothoracic & Vascular Surgeons, Charlotte, NC renews subscription to Surgical Group Scheduler (SGS). Hawthorne Calendar Administrators schedule 14 surgeons and PA-C's at 20 locations for surgeries, clinic procedures and meetings using SGS. Practice Administrator, Sandy Hartness says, "The accessibility is great - more than one person can be working on SGS at a time. The benefits include easily checking our Call, Vacation and Surgery schedule from home; the PA-C's say that they access it a lot from the hospital". Pacific Biomedical Equipment, Inc., a Northern CA autologous blood recovery mobile services group subscribes to Registry Scheduler (RS) system to manage and report on field technician schedules. Southern California Laser Partners (SCLP) subscribes to Registry Scheduler (RS) to manage and schedule field operations for mobile device service among 15 hospital sites in Los Angeles basin. Mobile Surgical Lasers, Inc., a Lenexa, Kansas-based medical device service operator subscribes to Registry Scheduler (RS) to manage field service operations in four states with a HIPAA-compliant, secure, SaaS designed by WebScheduler LLC. George Rappard MD, a solo neurointerventional radiologist in Glendale, CA subscribes to Surgical Group Scheduler (SGS) to track, report on, and schedule all call, vacation, and surgical procedures. Triangle Medical Professionals LLC, a Raleigh NC group of 17 Physician Assistants and Nurse Practitioners subscribes to Surgical Group Scheduler (SGS) to manage daily on-call, vacation and patient visit schedules. Says Andrew Liepins PA-C, a TMP partner, "We are familiar with this program because one of our cardiothoracic & vascular surgery groups uses it, too. We practice at multiple locations, and access to our complete schedule is essential to our continued success." First Prize for Surgical Group Scheduler (SGS) in "What Works"
Glendale Radiology Medical Group starts trial SGS on SurgiScheduler Web site; signs subscription agreement. Partners see patients at multiple facilities and obtain up-to-the-minute schedule changes through SGS textmail features. @surgischeduler welcomes Central Alabama Women's Care! 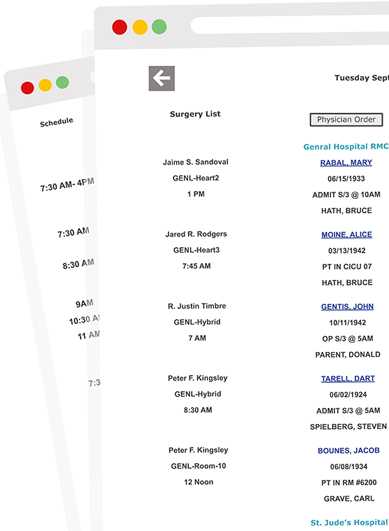 Our 3rd @baptistfirst surgical practice using SGSPro scheduling software. We are delighted to present a SurgiScheduler demonstration to our third University Medical School - Faculty Practice of Surgery.